Little Weirdos: Mini figures and other monster toys: Thor Lords: bizarro '80s fantasy pull-back toys! 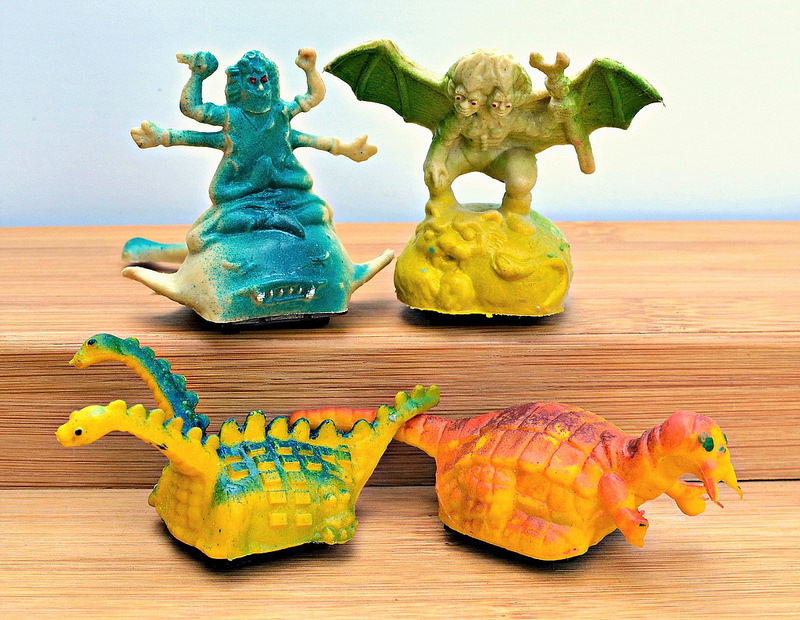 Thor Lords: bizarro '80s fantasy pull-back toys! Have I mentioned before how much I love toys that came out of the early 1980s "sword and sorcery" fantasy craze? Yes, about 100 times? Well, I'm saying it again because this post is dedicated to one of the most wonderfully weird '80s fantasy toy lines there is...THOR LORDS! 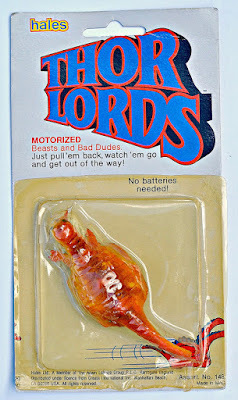 First of all, "Thor Lords" has got to be one of the greatest names for a toy line ever. It just sounds cool. Without even seeing the toys, you just know they're going to be awesome based on a name like that, and they most certainly are. Well, that actually might depend on how you define awesome. At the very least, they're unique. Thor Lords are small (around 2 inches tall), rubbery creatures with (crudely) painted details that were billed as "motorized beasts and bad dudes," in that they have a small plastic piece with wheels glued on their bottoms that allows them to zoom forward when pulled back and released. They were released in between 1982-1984 by Creata International in the U.S., and licensed for released by Hales in the U.K. The packaged example you see here is from the Hales release. 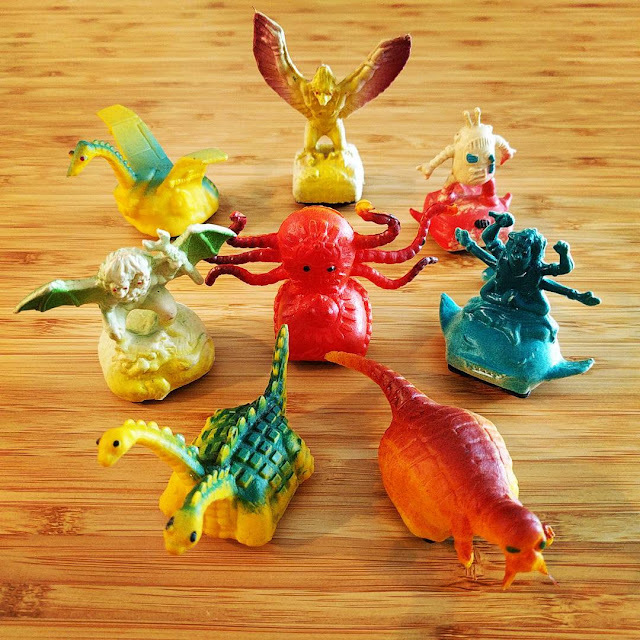 There are 8 different sculpts known to exist, including some dragons, a robot and some more unusual fantasy beasts. These 8 sculpts can be seen in the below photo from Instagram user bachamn. 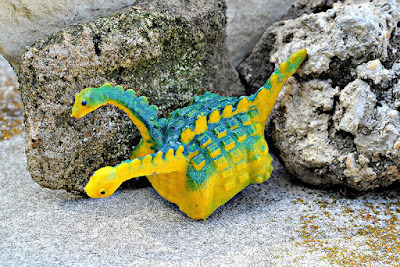 I own 4 of these bad boys and will hopefully eventually track down the others. Let's take a closer look at the ones in my collection. 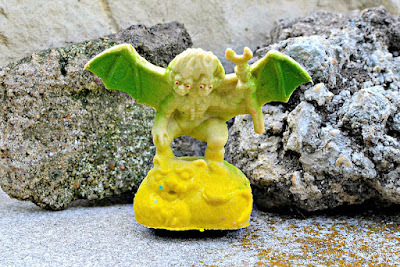 First up we have this winged, 2-headed baddie, which in my opinion is clearly the star of the set. He reminds me of a creature that could have been included in Fleetwood's The Sword and the Sorcerer line, another excellent cheapo fantasy line from the early '80s. Look closely--his base is actually a curled-up lion! Here's what appears to possibly be some sort of cross between a dinosaur and a walrus. I have no idea. It's a weird-lookin' critter though. 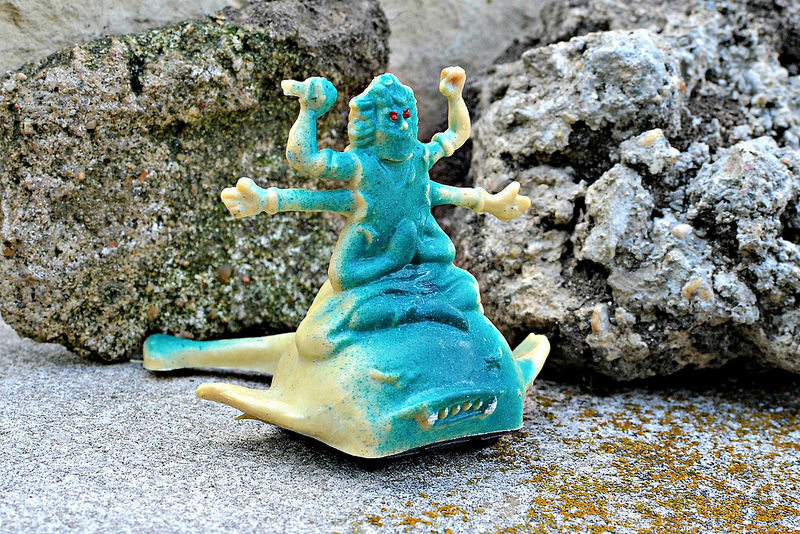 A kali riding a manta ray? Sure, why not. This guy is pretty much a garden variety 2-headed dragon, and looks too friendly to be anything called a Thor Lord, but I still like him. 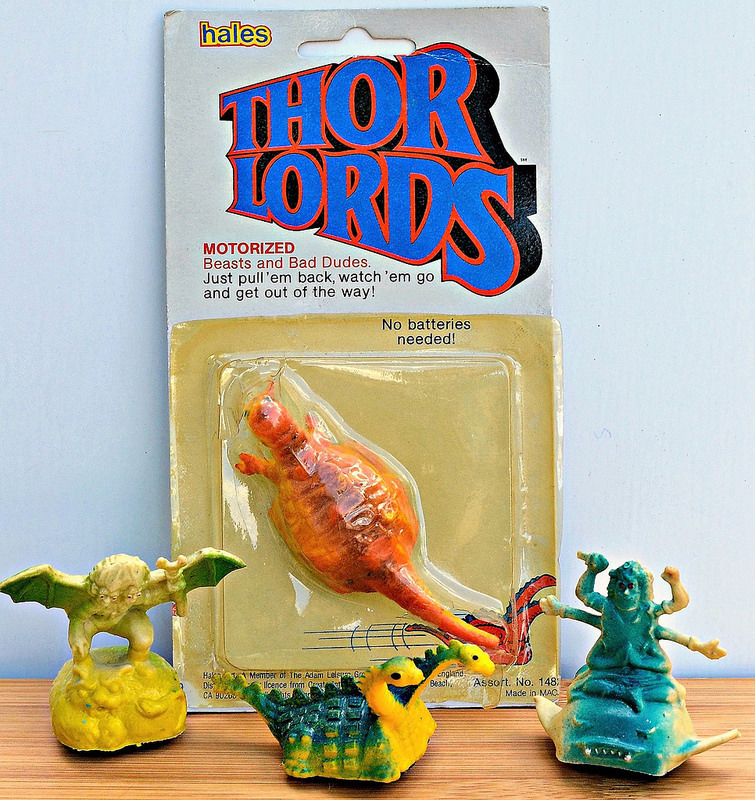 And there you have it -- Thor Lords, a toy line for the ages...or at least for toy store clearance bins circa 1984. Not sure about you, but I love 'em. For additional discussion on Thor Lords, check out the thread devoted to them over at the LittleRubberGuys.com forums. Haha, no, but that's always nice! Let me know if you decide you want to part with your cyborg/alien Thor Lord. I thought I knew a lot about 70's-early 80's cheapo fantasy & sci-fi toys... but I have never ever heard of these guys before. Great post, man. Outstanding post! 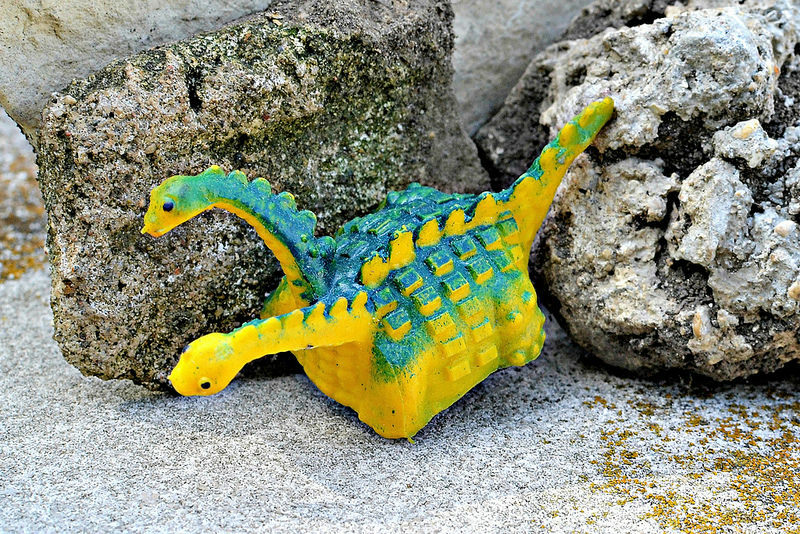 I have not seen a complete set of these guys before. The six armed guy on the little shark/manta/Kang thing is super cool. Thanks Shaun! That guy is definitely one of my favorites too. Thanks for the post! I first learned of Thor Lords via my interest in the company that made them - Creata International. This is the first I saw pictures! Rad!!! 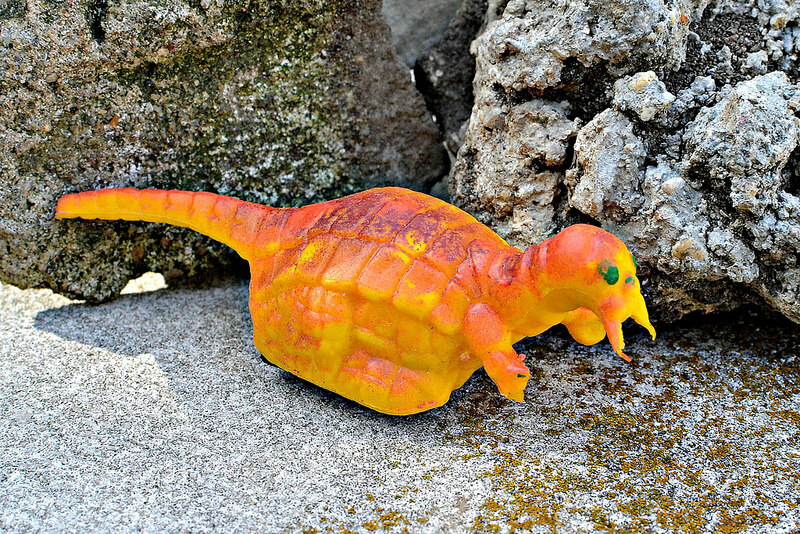 I was interested in Creata because they were located in Manhattan Beach and also produced one of the raddest '80s toys - Megadons. Thanks again!!! Thanks for reading, glad you liked the post!